Thank you for the information. I will inform the pharmacies. As always, I appreciate your help. Sherwin, hoping you can help. 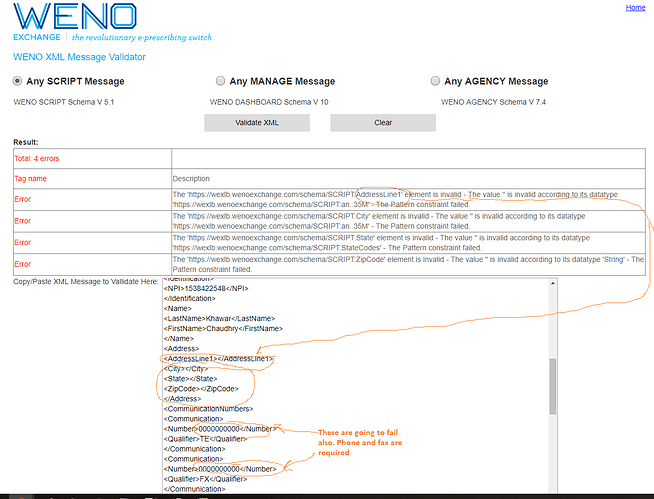 I set up Weno with OpenEMR and spoke to Rite Aid about sending a test prescription to see if it works. Pharmacy MUST have phone number. It looks like the pharmacy phone number is missing from your prescription. The fax number wasn’t included, I guess I need to call Rite Aid to ask for their fax. But when calling the pharmacy they said they didn’t get it. Sure, I’ll get the this over to research and get back to you with a reply. 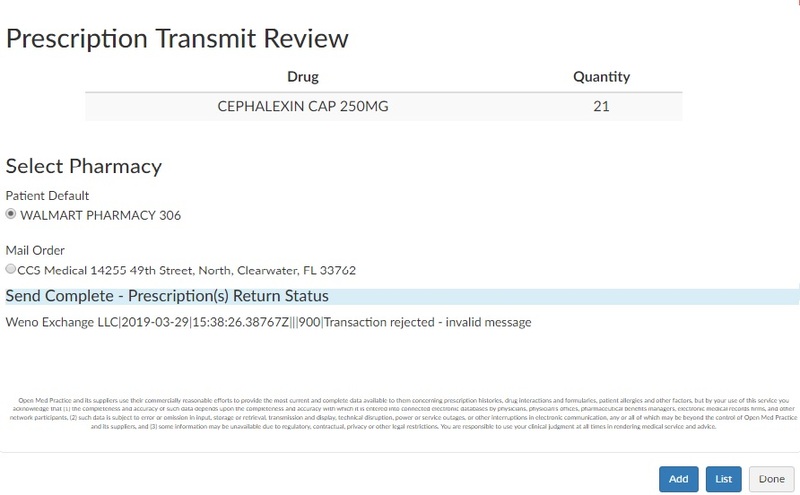 Can you share with me the Pharmacy and the drug that was ordered so I can find it in our system? There are often times that because the first transaction is sent via fax. Pharmacies often report the script as they didn’t get it. About how many prescriptions have you sent to this pharmacy? I have 12 messages that have been sent to this pharmacy NPI. The messages started 12-23-18. Please check phone and fax number and try again. No that is not from me. Is there a setting I need to turn to have my signature show up? Which pharmacies told you this? Currently there is not signature system with Weno. Also could you ask for a sample signature they are requesting be with the script. That is real funny as to how are you going to add a signature to an electronic prescription. Sounds like hog wash to me. I spoke to the pharmacist and explained it them just now. He said that it was fine. Thanks Sherwin. If anyone else brings it up i will let them know. You are welcome. I got a similar response from Weno.
" If the drug was controlled they may have that issue. Otherwise, they should call us or give us their name as the form clearly states it is ePrescribed and the prescriber has signed it using the credentials on his software. electronic signatures are valid for non scheduled anyway…and different from digital signatures." I have added the NCDP, NPI, phone, fax number of pharmacy but keep getting this error. It looks like allscripts/grease monkey option is no longer free. I did fond Brava eprescribe which is advertised as free, MDToolbox is about $30 per month for eprescribe. Are there any other reliable and cheap options in case Weno doesn’t work out for me? If you give me some information I can look up your attempts. What is your NPI. That will be the fastest way to find your message. I think this is your prescription. I matched your time stamp. The pharmacy information needs to be filled out completely. The address is missing and the phone and fax numbers are missing. All this has to be in the system to transmit and be successful. Please go into OpenEMR and fill in all the information for your facility. You can not send a prescription with the name of your facility being “Your Clinic Name Here”. thanks for taking time to help Sherwin. I was able to send successfully to Meijer Pharmacy by choosing print option. I have rejection results from Weno in the last few days. I attach here the Transaction rejection screen. Would you look into this for me. Thanks. We just fixed the issue. Please resend.